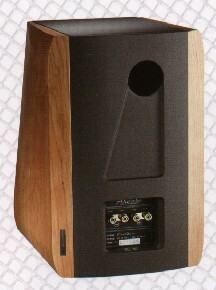 The One Zeta is the top of the line of the Aliante loudspeaker production. Simply put it is a turbo version of the less expen$ive One. It is a rather compact bookshelf (255 x 350 x 400), with pretty unusual looks, equipped with superb speakers: a 17 cm Seas woofer with a metallic ogival dust cap and a Scanspeak D 2905 1" tweeter, both designed and modified following strict Aliante specifics. The first order crossover network (see picture below) uses SOLO CFAC inductors, built with a thin film of pure OFC copper, ACOUSTICAL AUDIOCAP PPFF custom made capacitors (film & foil), anti-inductive custom made resistors. Internal cabling by Monster Cable. The craftsmanship is simply excellent and by simply touching the cabinet you can get an idea of the quality of this loudspeaker. The clever mix of Italian walnut sides and hi-tech design makes the One Zeta a loudspeaker which is very easy to match with any kind of furniture, both classical or hi-tech. For what is worth I like the One Zeta looks. The binding posts are of very good quality but, in my opinion, are still too near each other. I know this is a reviewer's point of view (we are forced to use different cables, so the binding posts MUST be easy to screw/unscrew :-) ) but I hope to see widely spaced connectors in the near future. Inside the elegant package that contains each One Zeta (yes, a single package for each loudspeaker) you'll find the famous felt rings to be used around the tweeter (to improve the depth of the soundstage) and the plastic sheets to be used to protect the cabinet from sharp pointed tip toes. The One Zeta under test is the less expensive of the 3 Zeta's available: there are two Pininfarina versions which cost slightly more (see for example the gorgeous Ferrari red One Pininfarina in the recent factory tour published here on TNT-Audio). Thanks to the friendly collaboration of the Aliante staff (Ing. Giuseppe Prato) I've been able to listen to these speakers for a very long period, with different systems and into different listening rooms. Judging the top of the line of a renowned loudspeakers manufacturer is always a difficult task and I was a little bit afraid of not being able to tell you the flavour of the One Zeta. After the One Zeta has been connected to my reference system each single doubt and fear melted like snow under this hot Sardinian Sun (well, actually we never see snow here :-) ). Better bass? Highs? Dynamics? No, a whole different musical experience. With loudspeakers like these the usual questions one asks during a listening tests make no sense at all. No, don't think the One Zeta is perfect and absolute: there's no such a thing in the HiFi market, especially at 3,000 $. What I'm trying to say here is that the One Zeta can't be judged with the usual parameters, it is so unique that using the same words as in every other listening test may give just a pale idea of the sound of these Italian jewels. Anyway, let me try. The tonal balance can be defined open with a sweet note of warmth in the upper high range. No, it is not a roll off, it is a silk smoooooth note instead. Imagine the light of a summer golden sunset over the sea: that is the idea the high range of the Zeta gives you. So the mid range: sweet yet very analytical and precise. The Zeta can detect and offer you any tiny detail of the recording without sounding clinical or cold. Yeah, I know this is an extremely difficult task for ANY loudspeaker, but I can assure you the One Zeta succeeds in doing this without any effort, even at loud listening levels. 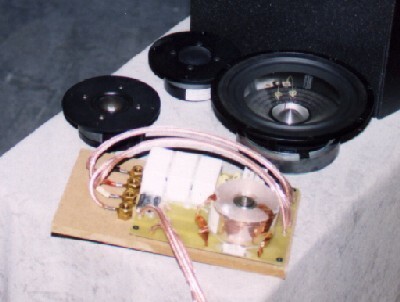 In few words the mid range can be compared with the one of a good (very good) electrostatic speaker, to say the least. What about the bass range, then? The sound reproduced by the Zeta is full bodied, so that bass, double-bass and organ are always correctly sized. It is not exactly a wall-shaking bass range but it still rather punchy and well extended. In order to be judged excellent it lacks some extra depth and punch but, given the size of the woofer and of the cabinet, one can't expect much more than this. Maybe, and I say maybe, with a different (larger?) cabinet and a different crossover one could get more bass from this Seas woofer, paying this in terms of musicality, coherence and purity of the mid-bass and mid range. I prefer the Zeta as it is: all the bass one needs and nothing else. I can assure you that there's no need for a lower bass add-on (read: subwoofer) as the One Zeta is a real full range loudspeaker. Finally few words about the coherence of this design: coherence is one of the parameters that can help you to distinguish an excellent design from a simply good one. Clearly the first-order no-compromise crossover network does its job making the cross between the woofer and the tweeter completely invisible at my ears like it was a one-way loudspeaker (yes, exactly like the Diapason Micra II). Macrodynamics is good and microdynamics is excellent. A deep sense of natural breath pervades the sound offered by the Zeta to my ears, so that it is easy to listen even at very loud levels without hearing any dynamic compression or distortion. The Zeta is pretty fast too, even if you won't need to, say, fasten your seatbelts during the trip. As any other classy madame the Zeta is never in a hurry, she knows exactly how to play Music, it seems she already knows the Music she's going to play. This loudspeaker can make you (easily) forget you're a reviewer (and what a sweet relieve is this!!!) and brings you back to the very essence of Music. Then you turn the volume down and enjoy the ability of these babies to play extremely good even at low listening levels. If you've already read other Aliante loudspeakers reviews here on TNT-Audio you may know that their forte is the inner ability to create a wide and impressive soundstage. I've been amazed by the 3D imaging of the Moda, for example. Now, the Zeta can do even better. Why? First of all it is the size of the soundstage to be impressive: wide and deep but even incredibly high. With the Zeta you can seat in an off-center listening position, even in front of one speaker only and the soundstage will remain exactly the same: wide, centered and well behind the speakers. You'll experience the somehow thrilling experience of being able to take a look around (side by side) singers and players. When this happens you know it is the stereophonic illusion at its best. No sound can be heard coming directly from the loudspeaker which becomes totally invisible. Place a pair of loudspeakers behind the Zeta, far away from them and then ask one of your friends (or your relevant S.O.) to detect which loudspeaker is actually playing, without putting the ears over the speakers, of course! You'll be amazed by the results. The focus of the image is excellent, it seems the virtual scene has been engraved into a huge block of white and grey marble. I'd rate this perfomance as absolutely excellent. He who buys such a loudspeaker should already know that a minimum of burn-in is needed (50 hours to say the least) and that excellent quality speaker stands should be used to achieve the best performance. Aliante makes some pretty nice (and good sounding) speaker stands for the Zeta. Placing the Zeta into the listening room is quite easy: far away from each wall and strongly angled towards the listening seat (30 degrees or even more). This is the easy part of the set up of the Aliante One Zeta. Don't forget these loudspeakers are primadonna's so an extreme care should be taken when choosing the right amplifier to drive them. Connect the Zeta to a budget system (it doesn't matter how much audiophile) and you'll be surprised by the result: a bold, edgy, undetailed sound will reveal all the faults of the system. Don't attempt to try this at home or the Zeta will punish you severely. 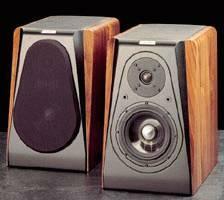 The Zeta is a top loudspeaker and needs top quality electronics. Let put this straight: would you use Yokohama AVS tires on your city car? You'll end up thinking these renowned tires aren't worth the money. The same applies to HiFi: while good loudspeakers sound fine with almost any amplifier, provided it has been designed to play Music (you know what I mean...), excellent ones need excellent partners. So, while a just good loudspeaker will sound just slightly better as the quality of the system increases, the excellent one will reveal any tiny improvement you make (front-end, cables or amplifier). With the One Zeta it seems there's no upper limit: their sound improves proportionally to the quality of the system. I'd say that a good class A solid state (power) amplifier could be a good partner for the Zeta, such as any good tube amplifier, provided it is not too slow or underpowered (1.5 watts monotriodes not welcomed here). Quality matters. I hope it has been clear that I liked the Zeta a lot. These loudspeakers do have something special and unique, a sound so natural that it is easy to fall in love with. The Zeta is a landmark bookshelf loudspeaker and I ask myself if the name Zeta has something to share with the last letter of the Italian alphabeth (you do know Zeta is the last letter of our alphabeth, don't you?). As usual, we owe a huge thank you to the Aliante staff for this unique listening experience.